I did receive 4 tickets to the Mickey’s Not So Scary Halloween Party and a parking voucher. However, all opinions are 100% my own and were not influenced by the fact that I received tickets. 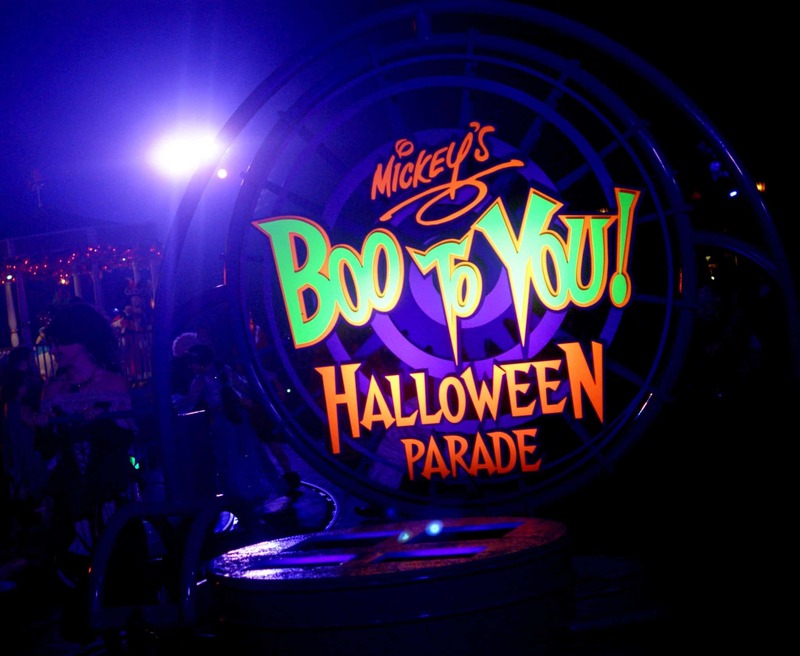 This year we had the opportunity to head out to Mickey’s Not So Scary Halloween Party. For the first time, we decided on having the entire family in costume. I will be sharing tutorials for the costumes in the coming weeks. Mickey’s Not So Scary Halloween Party is a separately ticketed event and well worth the ticket price. I am going to share some tips for you to help you make the most out of your time at the party. 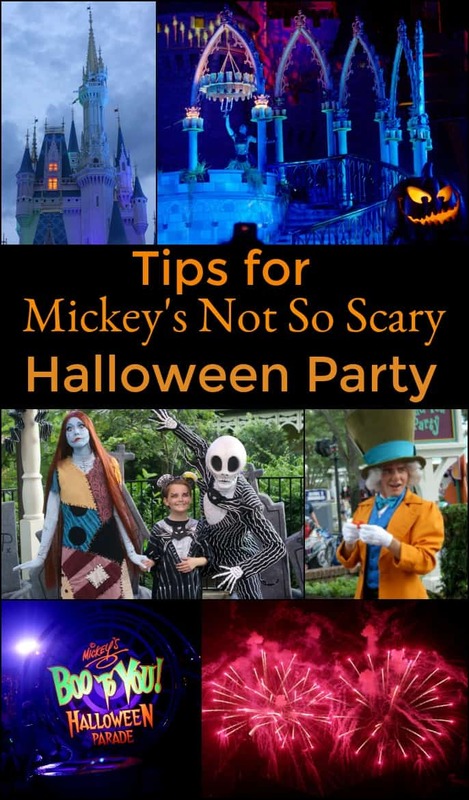 I hope these tips for Mickey’s Not So Scary Halloween Party help you to enjoy your trip. Before coming to the party there are some important things to keep in mind. Put together your costume. However, remember that Florida can be VERY hot so don’t go too heavy on your layers. Think of fun ways to go with short sleeves or shorts. You will receive a small candy bag. However, I recommend bringing your own bags or a backpack to dump candy in as you go. Book Fastpasses. – You will be able to get in early. 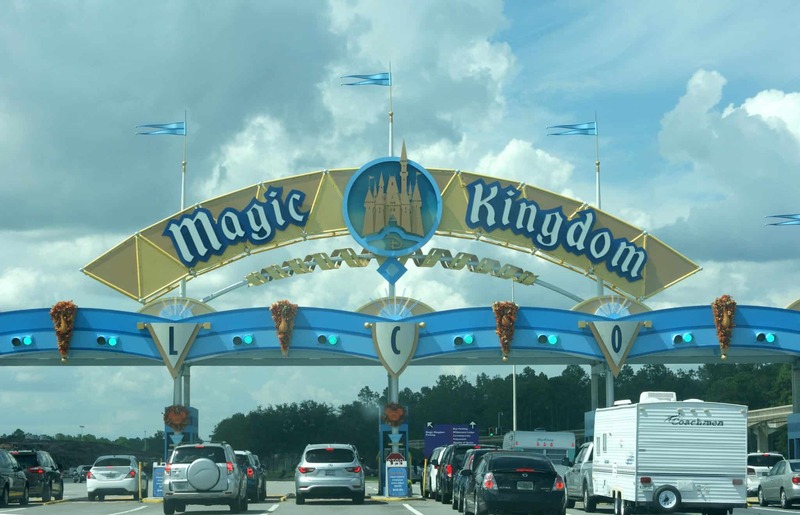 Book Fastpasses for any rides you would want to go on from 4-7. While the party starts at 7, you are able to enter the park at 4. ** Tip – Take the boat instead of taking the monorail. I found it to be a quicker and more comfortable trip. For the Not So Scary Party, there is a special Sorcerer Mickey Card. Make sure to stop in at the fire station to get your card if you want this fun freebie. The parades and shows are not to be missed! They will also fill up fast. If you want a good spot for the parades and shows you will need to be waiting at your spot up to an hour before it actually starts. We secured our spot for the Hocus Pocus Show and the Parade an hour before it began. You can attempt to go to later shows for lower crowds. However, make sure to base this on how well your kids will handle the later hour. 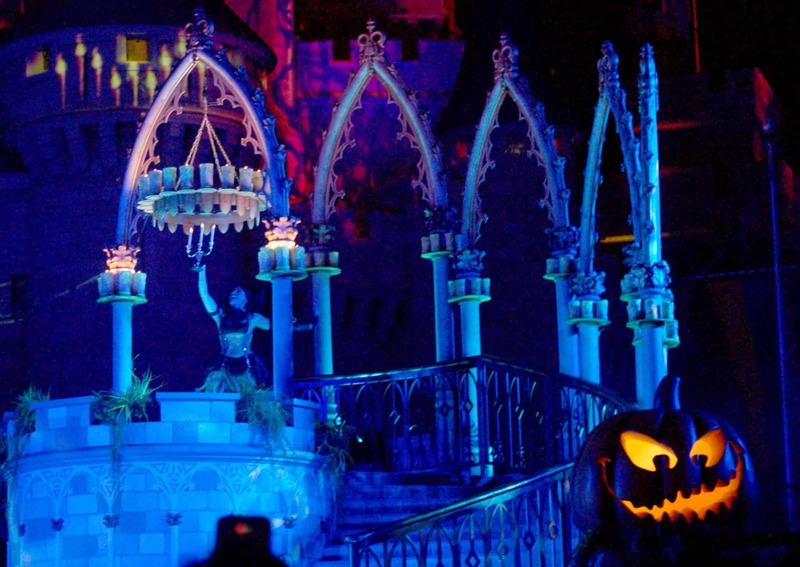 **Tip – For the Hocus Pocus show everyone directly in front of the castle will stand up and crowd in. Standing closer to the street will mean that smaller children will not be able to see. You are better off either getting right up front with your kids in the crowd or choosing a spot further away from the castle. 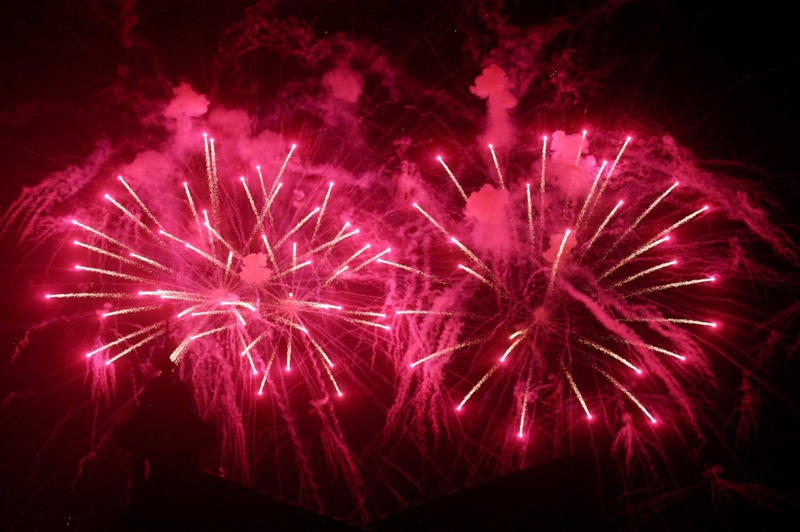 ** Tip – If you have a sensory sensitive child, there are a couple small fireworks in this show. For our trip, we had our hearts set on meeting with 2 very specific characters. 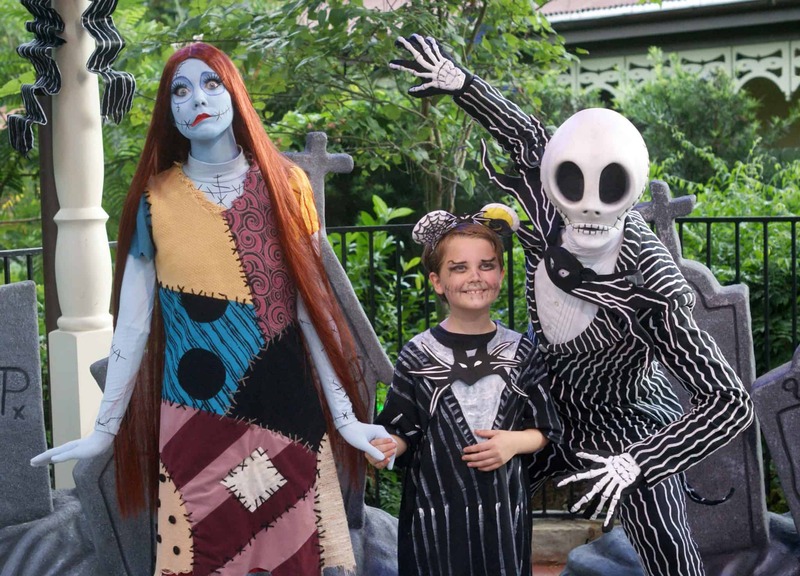 Because my son was wearing a Jack Skellington costume we knew we had to meet Jack.My daughter’s absolute favorite Disney character is Alice so we also wanted to see her while we were in the park. Because of this, we had to be in line to see them early. We went directly to Jack Skellington when we got in at 4. We were probably 50 people back at that point in time. Because of inclement weather, although Jack started meeting at 5:00 we didn’t meet with him until 6:25. Be prepared for long waits if you want him. That said, he is worth every second of the wait. Watching my son laugh with him was worth waiting in the rain any day. Not all characters will have longer lines. 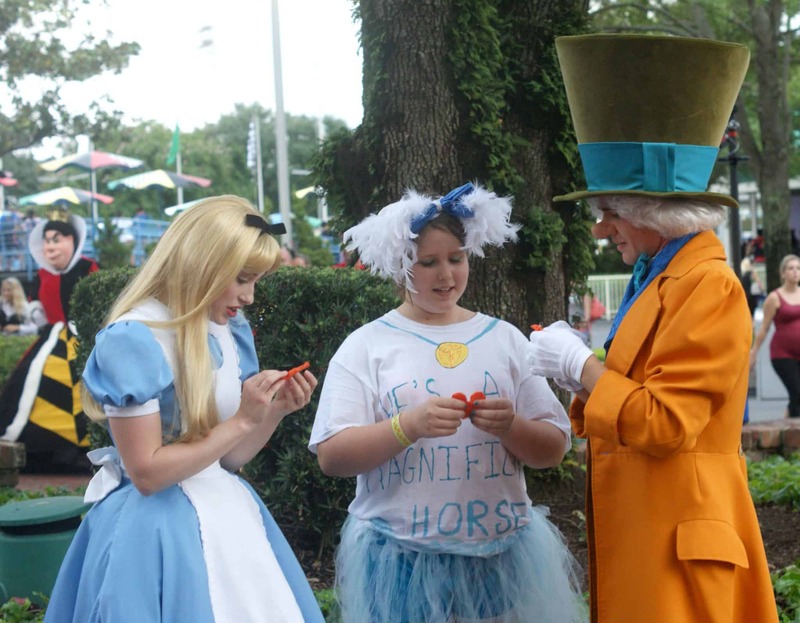 For Alice, we were able to spend some time with her and Mad Hatter after a 15-minute line. ** Tip – Find something fun for your kids to do with the characters. This could mean a fun question or a small gift that your kids make for them. These little things will really make their interaction so much better. They get to become a part of the story for a minute and you just can’t beat that. There are quite a few candy trails. There is no limit to a number of times you can go through a candy trail. We really like the trail in the Mickey’s Philarmagic as there are two candy locations in one building. ** Tip – Make sure your bag is open and ready. Some of these need you moving thru pretty quickly depending on the crowd at your party. Disney pulls out all the stops with the fireworks show! If you want the traditional view, find a spot in front of the castle. If you do nothing else at this party, go to the parade! In my opinion, this is the BEST Disney parade you will see all year. It’s just such a perfect blend of amazing characters and fun moments. I can’t recommend it enough. If you do the first parade, get your spot an hour early. It will get crowded. 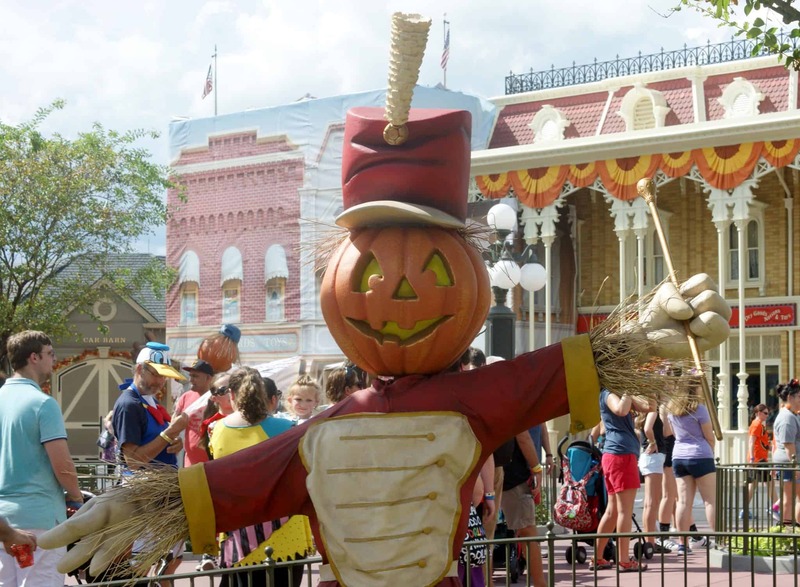 What if it rains at Mickey’s Not So Scary Halloween Party? Florida is well known for having weather that changes its mind frequently. Because of that, there may be a chance of rain on the night of your party. It poured most of our party. That said, you can still have an absolute blast. I know my son danced in the rain and had a blast. ** Pack a rain coat or poncho. It also helps to have a bag to put your costumes in if the rain and your costumes don’t mix well. If you forget to pack them, most shops will have ponchos you can purchase. ** Ride lines will be shorter. Even with the pouring rain the longest line we saw was Peter Pan for 30 minutes as far as rides go. Go enjoy some of the rides you normally have a hard time riding because of lines. ** Disney will do their best to keep the characters they can out. They may move them but you will be able to ask a cast member about availability for each character. ** Shows, parades, and fireworks may be canceled for the safety of the performers. There are plenty of other things to enjoy so find a new version of fun. If it decides to rain on your party, find a new way to make it fun for yourself. There are still great rides, treats, characters, and shopping opportunities in the park. This is my BIGGEST tip! Everyone will head up to the monorail. Do yourself a favor. Don’t! Instead, head to the ferry. You will be able to get on it a lot quicker and deal with a smaller crowd. Get your Mickey’s Not So Scary Halloween Party tickets 2017 to any of the dates below on Disney’s Website.